Michigan is coming off of back-to-back losses to Big Ten opponents. Tate Forcier is concussed and has a shoulder injury. Carlos Brown also suffered a concussion recently. And the team seems to be reeling after two soul-crushing, close defeats. So what is there to say about this week's opponent? 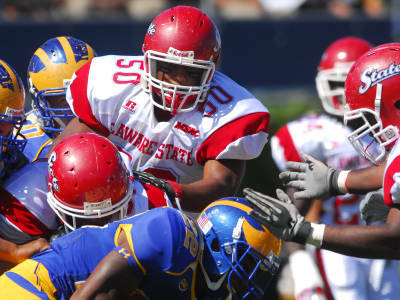 Delaware State is a 1-3 1-AA opponent that lost to a school named Bethune-Cookman by a score of 9-7. Their kicker is 1 for 6 kicking field goals. They rank 100th (!!!) in total offense amongst FCS teams, averaging 265 yards per game and only scoring 8 TDs in their four games. Their defense? 92nd amongst FCS teams, allowing 392 yards per game. They do, however, only allow a little over 15 points per game, which is good for 14th among FCS teams. Let's put it this way: Delaware State is not Appalachian State. In fact, if all goes as planned on Saturday, Delaware State jumps from 1-3 to 1-5, after only having played one game, because they forfeitted a conference game for the chance to play against Michigan in the Big House (read: $$$$$). Quarterback Anthony Glaud is averaging 144.5 yards-per-game, completing 57.5% of his passes, and has a 2/2 TD/INT ratio. Their run game is in trouble as one of their top two backs, Jason Randall, will miss at two to three weeks with a leg injury. Needless to say, this Delaware State team is... not a threat. So that leads us to Michigan, who will likely try to play as many young players as long as possible. Yesterday I went in depth about the redshirt status of Justin Turner and talked about the secondary in general. I had completely forgotten, however, about Vlad Emilien, a four-star safety recruit out of Florida who we've also yet to see take the field. Emilien is exactly who you'd want to see on the field against Delaware State, and someone you'd hope could quickly replace walk-on Jordan Kovacs (who's done an admirable job in his time on the field) in the secondary. IMO, it's more likely to see Emilien on the field tomorrow than Turner if for no other reason than we need bodies that have played safety before to be ready to play. With Woolfolk's move to cornerback, Michigan officially has two safeties who have seen playing time this year. Regardless of Cissoko's status or the general talent deficiencies of JT Floyd, there are still able bodies that can be put in at the corner position. And with Woolfolk proving in his first game to be an above-average corner, Turner now has more competition at the position. Not that I necessary expect either Turner or Emilien to play, but the latter is far more crucial to the immediate success of the defense than Turner. As for the rest, expect to see lots of Michael Shaw, Vincent Smith, and Denard Robinson. Also expect to see Will Campbell get a lot of time in this game, who Brian Cook has been asserting had a truly awful day against Iowa in limited time--I didn't notice. The people I'm interested to see on the field are Kelvin Grady and Martell Webb, though. In Rodriguez's last press conference, he, in so many words, said that Grady had hit a freshman wall but will be incorporated more into the offense in the future. I want to see Grady on the field and see what he can do. Because for all of the OMGGRADY! coming out of spring and fall camp, he's been mostly unremarkable, notching eight catches and one rush for a total of 65 yards, plus a whole spattering of dropped balls. Webb, meanwhile, has seen his playing time significantly diminished when in back-to-back games, he dropped balls that hit him squarely in the numbers. I assume Rodriguez is going to want to see what he's got in Webb and have him split reps with Koger who has been masterful.